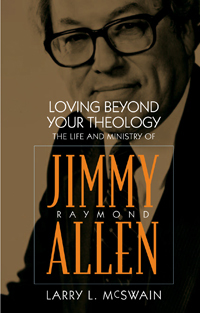 Jimmy Allen served as the last “moderate” president of the Southern Baptist Convention concluding his second term in 1979, the first year of the emergence of a new “fundamentalist” leadership of the convention. His life parallels the movement of Baptists in the South from a folk people rooted in a predominantly rural ethos into an urban, increasingly educated, and diverse people. He was an activist of the first order, engaging in state and national social agendas of civil rights, strict separation of church and state, and the application of the gospel in all areas of life. His commitment to social action was often lived out in a highly public way in partnership with President Jimmy Carter and it took him to China, Israel, Iran, and many other regions of the world to promote aggressive mission efforts. He was among the few Americans to visit with the Ayatollah Khomeini during the Iranian hostage crisis. Allen’s ministry was often lived amid the stresses of mental illness and dysfunctions in his family as well as a major crisis with the HIV and AIDS viruses that took the life of his daughter-in-law and two grandsons. His is a story of trust in a faithful God amid personal suffering that led to remarkable contributions to America’s religious faith.